Going hungry can prolong life? Just read an article on the recent Time Magazine discussing the research on restricting calories and living longer. That seems to make sense. The body of a human beings was originally built to conduct enormous physical activities for hunting and gathering food and to withstand the hardships caused by scarcity of food. Abundance causes all sorts of problems. Even my mom, a traditional health conscious Chinese woman who does not care much about western medicine, has always been telling my dad and everybody not to eat to a full stomach, 80% is sufficient. I think that is the Chinese attitude towards everything in life and I follow it as well. Moderation is the key. And here is the way to enjoy all the yummy food that you can have: portion control. 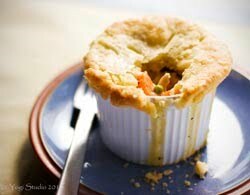 Specially made for my hubby, N, is this mini chicken pot pie, hoping that he will adopt the principle of moderation. This is a recipe from The Best Recipe by the Cooks Illustrated Magazine. Kitchen notes: I have made this several times with a big baking pan. This time, I made the individual portion size. I only used up half of the ingredients for making four mini pies. The rest of the pie dough and fillings are in the freezer. I will see how they hold up. As for the pie dough, Since unsalted butter is used in the fillings, quite a bit of salt has to be added. Please taste the fillings and adjust to your personal taste. This is a pretty basic recipe. You can vary the types of vegetables such as adding mushrooms or herbs to suit you own taste. The white wine (I don't have dry sherry) really enhances the flavor. Don't skip it! Mix flour and salt, put mixture in food processor. Scatter butter pieces over flour mixture, tossing to coat butter with a little of the flour. Cut butter into flour with five one-second pulses. Add shortening; continue cutting in until flour is pale yellow and resembles coarse cornmeal, keeping some butter bits the size of small peas, about four more one-second pulses. Turn mixture into medium bowl. Sprinkle 3 tbsp ice-cold water over mixture. Using rubber spatula, fold water into flour mixture. Then press down on dough mixture with broad side of spatula until dough begins to stick together. Test the dough with your finger by squeezing a small portion between your finger. If the dough is moist and comes together, then pour the dough onto a floured work surface. If not, add 1 to 2 more Tbsp of ice cold water. On the work surface, gather the half crumbled dough together and shape it into a ball and then flatten into 4" wide disk. Wrap in plastic and refrigerate 30mins or longer while preparing pie filling. Adjust oven rack to low-center position; heat oven to 400 degrees. Cook chicken with broth - Put chicken and broth in medium size pot over medium heat. Cover, bring to simmer; simmer until chicken is just done, 8 to 10 minutes. Transfer meat to large bowl, reserving broth in measuring cup. Cook veggies - Increase heat to medium-high; heat oil in now-empty pan. Add onions, carrots, and celery; sauté until just tender, about 5 minutes. Season to taste with salt and pepper. Shred meat - While vegetables are sautéing, shred meat into bite-sized pieces. Transfer cooked vegetables to bowl with chicken; set aside. Make sauce - Heat butter over medium heat in again-empty skillet. When foaming subsides, add flour; cook about 1 minute. Whisk in chicken broth, milk, any accumulated chicken juices, and thyme. Bring to simmer, then continue to simmer until sauce fully thickens, about 1 minute. Season to taste with salt and pepper; stir in wine. Pour sauce over chicken mixture; stir to combine. Stir in peas and parsley. Adjust seasonings. Fillings can be made ahead and refrigerated. Roll dough on floured surface to approximately 1/8-inch thick.. Put individual ramekins upside down on dough. Using a pair of scissors, cut dough rounds about 1/2" to 3/4" larger than the size of the ramekins. Depending on the size of the ramekins, you should be able to get 6 to 8 rounds. Pour chicken mixture into each ramekin. Lay dough round over pot pie filling. Press overhanging dough against the edge of the ramekins to seal it. Cut four 1/2" vent holes of one1-inch vent hole on the dough topping. Bake until pastry is golden brown and filling is bubbly, about 25 to 30 minutes for smaller pies. Serve hot. Great! 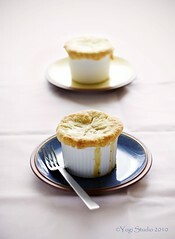 I have the perfect little cute dishes to make those pot pies and I've been wondering what to do with them except storing home made sauces. Thanks a lot for sharing this recipe! Your photos and presentation are beautiful. 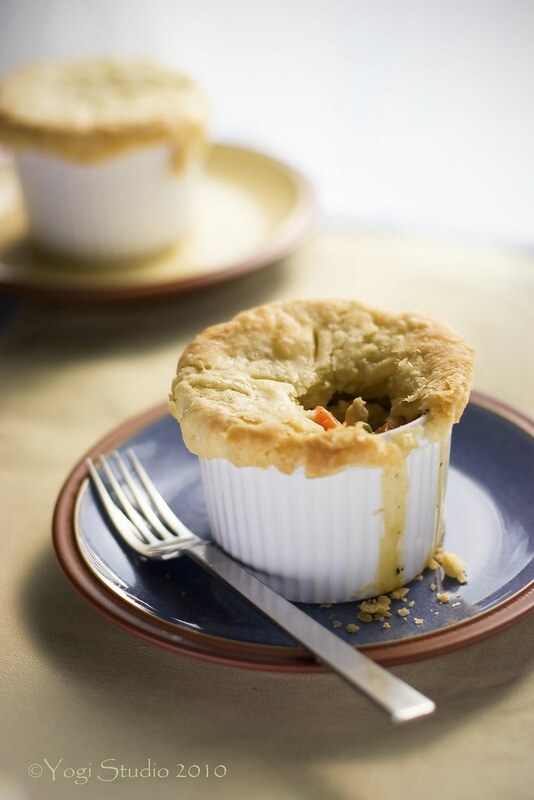 This chicken pot pie looks delicious. I would have to go without the alcohol though haha. Thank you for sharing this recipe. Thank you. Please do try the recipe. It's much better than what you find in a restaurant or the pre-cooked ones in supermarkets. I love mushrooms in my chicken pie so I added some lightly fried white mushrooms to the filling mixture. It was delicious - especially impressed with how well the wine flavors the filling. This is the first time i see chicken hot pie like this. I will try to make it. And hopefully I will sucess.